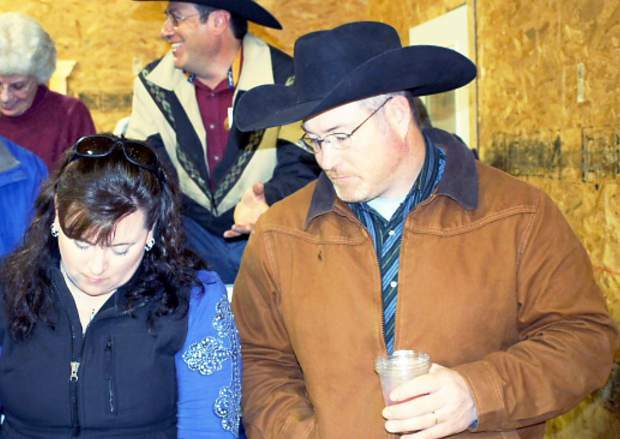 Walt and Angela Murray of Miles City, Mont., made their selections of Pine Coulee genetics. Watty and Lila Taylor of Busby, Mont., are long-time repeat buyers of Pine Coulee genetics. Location: New sale facility at their Wagon Box Ranch, Hardin, Mont. The John Carrel and Jim Stampfel family's put together a set of bulls for their annual Pine Coulee bull sale this year that was as tremendous as their new sale facilities at their Wagon Box Ranch between Custer and Hardin. You had to use 4-wheel drive to reach the sale barn, due to all the mud, but the recent moisture sure has cattlemen optimistic and ready to continue their herd with quality genetics, versus last year when talk at the sales was which cows to keep. Buyers came from miles around to bid and purchase the Pine Coulee top quality genetics. 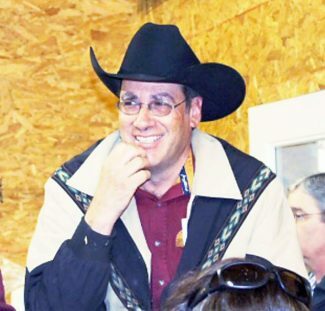 Both the Carrell and Stampfel families run operations with significant commercial cow herds. The sire lines they sell in their annual sale have been tested for convenience, efficiency and profit traits in these herds. If they find a sire that does not work in their commercial herds, they don't propagate those lines in their purebred herds. Additionally, the Carrels and Stampfels also run yearlings and finish some cattle to see how the final product stacks up. Some of the top sire groups offered at this year's sale were Connealy Impression, S A V Resource 1441, McCumber rito Rolette 1108, Conneally Thunder's Chisum 6175, S A V Final Answer 0035, Connealy Right Answer 746, Pine Coulee Battle W815, and Sitz Uncommon. The pre-sale lunch was phenomenal, and the barn filled up as sale time approached. From the first bull to the last, the bidding was fast and furious and stayed consistent throughout the sale. The bulls were all in top condition, full of muscle, and very correct and balanced. Pine Coulee sincerely believes a working relationship between the seedstock and commercial producer, at the grassroots level, is the best way to ensure longevity and profitability for both parties. 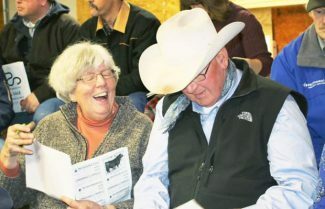 The way they present their bulls, the way that they value every customer, as well as the number of repeat buyers at the sale is proof that they are doing more than just selling bulls. John Carrel and Jim Stampfel focus on both the maternal and paternal backgrounds of their cattle. They also do a fantastic job of breeding and representing their cattle and have undoubtedly acquired some new, long-term customers at this year's sale. Hat's off to a job well done gentlemen. Lot 103, selling for $9,500, a future herd sire, had more muscle and shape to him than most bulls I have seen so far this season. This SAV Resource 1441 son out of a great SCR Eileenmere 80673 dam is the real deal in my book. He boasted EPD's of (BW)2.4(WW)63(YW)114(MILK)26. Kelly Unruh of Hebron, ND, was the winning bidder on this grand bull. Lot 63, sold for $9,250-a very complete, deep and long Sitz Uncommon son out of a great Pine Coulee Blackbird S104 dam. This powerful herd sire prospect boasts EPDs of (BW)3.3(WW)57(YW)85(MILK)30 and having a weaning weight ratio of 113. When it was all said and done Brett Lesch of Ekalaka, Mont. Lot 127 sold for $9,000, another Sitz Uncommon son out of the B5 Blackcap 528 cow that goes back to BAR Traveler 205. This bull had replacement heifer quality written all over him. Smooth fronted but big topped, deep bodied, square hipped and about as correct as you can make one. EPDs of (BW)3.6(WW)53)(YW)86(MILK)36. Brett Lesch of Ekalaka, Mont., wasn't going let this one get away either and should have one heck of a set of calves next year. Lot 85 sold for $8,250, a grand future herd sire that had muscle, eye appeal, top, depth and a great disposition out of a Pine Coulee Blackcap cow that goes back to the great cow making sire N Bar Emulation EXT. Brett Lesch of Ekalaka, Mont, was also the lucky winning bidder of this nice bull with EPD's of (BW)1.5(WW)64(YW)103(MILK)27.